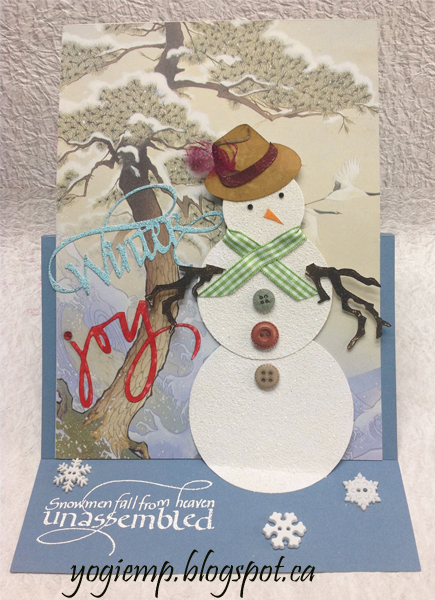 I'm using one of the NEWEST "A Way With Words" dies from Elizabeth Craft Designs ("4 Seasons " 4pce die set), designed by Suzanne Cannon (also available HERE). I'm also using a quote stamp ("Snowmen Fall From Heaven...") from Quietfire Design and a couple eCut files ("Fedora") & ("Joy") available on the Silhouette onLine store. So to see all the details and descriptions etc, just click on any card image or click HERE to go to my website, Enjoy. What a fun creation Yogi! Love how you 'decorated' your snowman and I agree ... I'm not in any hurry to be making a 'real snowman' LOL! Thanks so much for playing in our ‘OUTDOOR FUN’ challenge at Dies R Us! Please come back again soon! hello Yogi! 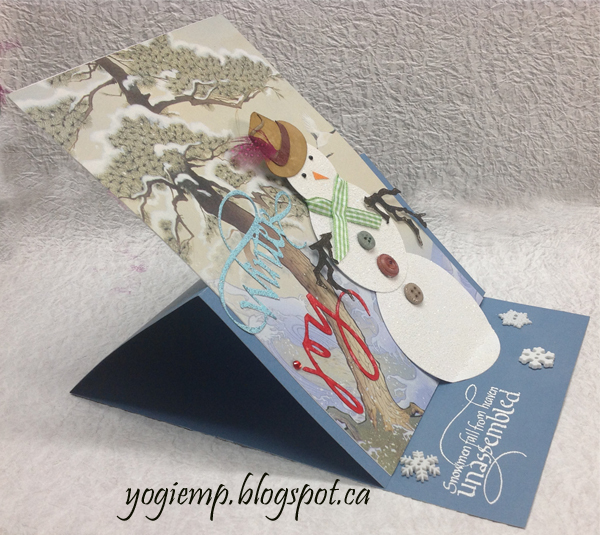 awesome pop up card, an adorable snowman! I am so glad you played along with us at simon says stamp wednesday challenge! I couldn't agree more, this is definitely a much warmer way to create a snowman. He is darling and I love that he's an easel card. The buttons are the perfect addition. I'm so glad I got to see this cutie. Thanks for joining us this week at the Little Red Wagon Challenge! A really lovely creation Yogi and such pretty colours, many thanks for joining us at Allsorts challenge this week. Love the scene you have created. Thank you for joining us at QKR Stampede this week. Brilliant Christmas card and thanks for sharing at craft this week. I'm back on behalf of the CRAFT Challenge team. Thanks so much for joining our sparkle and ribbon challenge this week! Yogi this is such a lovely card! I really like the style and the gorgeous sentiment! Great job! Thank you so much for linking up to our challenge at Dies R Us! I hope you have a wonderful day and hope to see you in the next challenge! Lovely card. Thank you for joining the Fun Day Friday challenge at Jo's Scrap Shack. Hope to see you again next time. I love easel cards and this one is just spectacular!!! Thank you for joining us for this week's QKR Stampede Challenge. Oh wow...such an amazing card!!! I just love everything about it. Thanks for joining Fun~day Friday at Jo's Scrap Shack. Very wonderful card creation! Thank you so much for entering the Anything Goes challenge at Through The Craft Room Door this week. Looking forward to see you again next challenge. What a fun easel card! I love that you said you "built the snowman"; definitely much warmer than for real. : ) Thanks for playing with The House That Stamps Built and Jo's Scrap Shack. Beautiful card love the cute snowman he's adorable.